And so do we! Make our park your home while you re-live Civil War history, visit the world's largest freshwater aquarium or ride the Incline Railroad. We offer groomed, shaded sites with every amenity-just 1/2 mi off I-75. Nice park we have stayed at 4 times now. However as I have said in previous ratings the sites are narrow and are gravel/dirt. It had rained lately and there were lots of mud and puddles around, I guess that Tenn clay doesn't drain that well. My biggest negative this time is their TERRIBLE WiFi. They said their other one was hit by lightening but you might as well not have any as their signal was almost non-existant. We would still return again as the people in the office are very nice and it is a very pleasant park. Good cable tv. 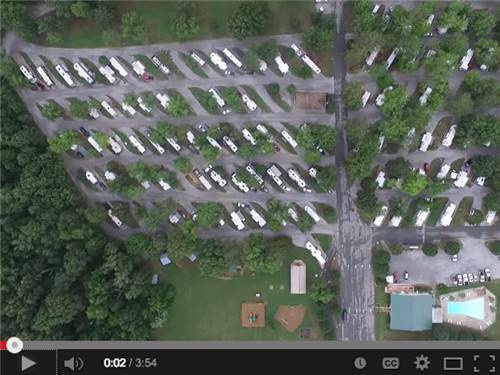 Nice, clean RV Park. Ladies in the Office were extremely courteous and friendly during the check-in process. The Park is large and the roads were easy to maneuver with my 40 foot 5th Wheel. There are some trees in the park but with our visit in February, there were no leaves on the trees so I can’t speak to shade in the park. Other than the entrance road which is paved, the entire park is gravel with the roads well graded and level sites level. Our site was long allowing me to easily disconnect and have plenty of extra space to park my truck. Cable TV is available at the sites providing a lot of channels. WiFi is not available. The utilities at our site were in very good condition. Each site had a concrete patio and picnic table. The Restroom/Shower house was clean and in good condition. The only negative I saw was the park was flat with little drainage for rain water. When we arrived it had rained earlier in the week and there were puddles of standing water in some roads and sites. It rained the entire night before we left and my site had a lot of standing water which made disconnecting the utilities and connection to my 5th wheel troublesome due to having to avoid the standing water. With Good Sam discount the rate was $41.40/night. Would stay here again. We stayed 12/27-28/18. Easy access on/off from I75! Check in was a breeze - we did have a reservation. Camp store was well stocked with essentials. We did not need to disconnect our tow vehicle to access the site for our overnight stay. We had one of the many pull-thru sites that easily accommodated our 38 ft. coach and 17 ft. tow vehicle. Level site had a solid gravel base. Campground roads were wide and easy to drive. Site had solid 50 amp power, good water pressure, and sewer connection. It rained hard all night and there was no standing water in the morning. We plan to return. No internet reliability. Office said we would not be able to stream, but we could count on wi-fi around the park. Could not maintain a connection, and it was so slow could not get emails or look at social media or Google Maps without being bounced off. Sites are too close together no privacy, and a bus got stuck turning the corner near us. Showers not great, but clean. Asked about road traffic before booking and was told not a problem, but it sometimes is loud. Out of 5 stars, I’d like to give this park a 3.5. It’s a very well kept and adequate place to stay, about 10 miles south of Chattanooga just over the state line in Georgia. The people running the park are friendly and efficient. It has a nice convenience store in the office. A clean pool to refresh from the heat. Good laundry room and shower facilities. The drawbacks are how small and tight the spaces are. The roads are narrow and the rigs are simply stacked into the area as tight as they can make it. On a full day, the place looks like a parking lot and is noisy and dusty. We spent the week staring at the side of a Class A next door, which was close enough to hear them walking inside. Couldn’t extend awning. Site had firepit but located directly under slideout. Campground seems to be set up with permanents on one side and transients on the other. Sites are gravel, with small patio and narrow grass strip between. Water pressure a little low, but otherwise utilities are fine. This is the second time we stayed in this park. People in the office can't do enough for you to make your check-in and stay perfect. if you are going to visit the battlefield parks in the area they have a free video to watch before you go and you can borrow their cd to take the auto tour of the parks. The sites are a tad narrow and I wish the electric/water/cable/sewer were a little farther down the site because when pulling a toad you have to pull in pretty far away from them so you need long cords to reach, other than that no problems. We did not use the bathrooms so we can't evaluate that. Great grassy areas in the front and back to walk your pet. However, their front fenced in dog walk has gravel instead of grass. I don't like that and neither did my dog. Very near attractions and easy off the interstate. We will come again. We stayed here in late October and again in early November. We had a late arrival the first time but everything was prepared for us when we arrived. The sites are tight both getting in and departing. Really depends on where others have their vehicles parked. Some trees make it tight also. Lots of shade trees. Cable connection stripped out on our second stay. Park is in the flight path of the nearby airport. Lots of flights early morning. Overall this is a nice park if your passing through. Close to restaurants and Camping World. Easy access to park off I-75. Definitely will stay here again when passing through. Front office people easy to deal with. Site approach and site were fine. Nice area away from traffic noise but very close to Chattanooga. WiFi signal very weak and slow. Pool could use some maintenance on the deck area but water was clean. Very nice park right off interstate I-75 just as you enter Ga into Chattanooga from the north. As a matter of fact it is on exit #1. Treed sites in the non-seasonal section are nice, still pretty close to one another but nothing terrible. Nice quite park, great pool and a great place to see the eclipse (this time). Bathrooms are individual, clean and air-conditioned. Nice green area (tenting area) to walk your dog. They have a dog park but instead of chips or the like they have pebbles, good for them I guess but not so good for the dogs but that is the only negative I came up with. If you are travelling on I-75 north or south, great place to stay the night or for a few days to explore Chattanooga. In case you are not towing, there is a Dollar General across the street and you can bike for less than a mile to reach many fast food joints and a very nice Greek Restaurant, Portofino. Stayed during August for a week with 10 other RV's in our Good Sam Club. The sites are level, clean, quiet, all pull thrus, some have shade. It rained almost every day for a little while off and on, drainage around the campground was good. The staff\ was very friendly and helpful. The group meeting room was excellent with a full kitchen and restrooms plenty of room for all of us and more. 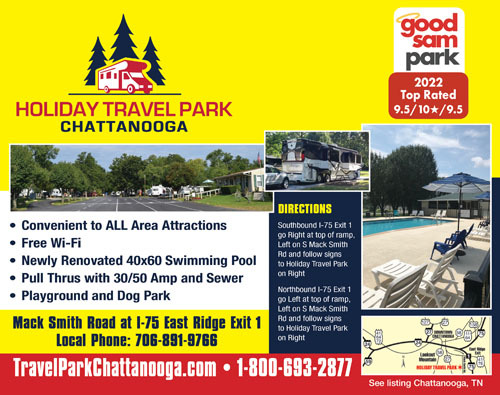 The campground is close to Chattanooga to visit all the city has to offer if you have transportation. A Camping World and a Bass Pro Shop are just across the interstate. Lots of dining is at the exit as well as a Baskin Robins ice cream shop. Kind and courteous on the phone when booking. Kind and courteous when we checked in. Sites are well maintained with everything working. Camp store has plenty of RV supplies, just could use some more snackies. WIFI is good and cable was good. Campground is on an old Civil War Battlefield, which is pretty cool. Would definitely stay here again. Good experience! Thanks! Very nice park. Getting there was a little odd, but don't let that worry you. Clean, well laid out, the sites were easy in and easy out. We arrived late, our arrival packet was taped to the registration door. It was easy figure out where our site was and get set up for the night. The facility is very nice and has the cleanest restrooms I've ever seen; however, what the reviews don't tell you is about the noise!!! Unless you live in a place like downtown NYC and are use to that volume of external noise, find another place to stay. The highway noise from I-75 is more than noticeable. The train noise (whistle and rumble) will wake you up every hour but worse than that is the aircraft noise. The campground is located directly under the approach path to the Chattanooga airport and the jets fly over at very low altitudes and rattle the windows. Add to all of that the sirens from the fire trucks as they respond to call after call all night long. After one night with no sleep and no hopes for getting any we packed up and moved to another campground. Nice place but bad location!!!! This is a large park, with lots of what appear to be permanent sites, but about half are transient. We were here during a rally so the place was full. Sites are almost all pull through, but are very narrow. Just long enough for our 38 ft. trailer and truck. Utilities are fine but wifi is very slow. Roads are just barely wide enough to navigate. We had some shade. Even though full, place was quiet. Excellent staff and best restrooms / showers we have experienced, definitely lives up to the 10 rating! Nice dog run. Lots of shade for walking around perimeter of park. With Labor Day weekend approaching and a hurricane about to hit Florida's west coast (where we live), The staff went above and beyond expectations to allow us to add 3 extra nights without changing sites while waiting for the hurricane to clear Florida. The only down side was the distance to the dumpsters (no site pickup). Sites are close together but we never heard any noise from nearby campers. Staff provided easy directions to attractions like Ruby Falls, Rock City, TN Aquarium, etc. We will definitely stay here again! Stayed for the weekend in our travel trailer. Staff was friendly and helpful. Park is pet friendly with a dog park on site. Wi-fi was slow at times and some noise from local race track could be heard outside until about 11PM each night, but wasn't bad inside RV with AC running. Overall experience was good. I did have to use wood to level out the rig and the Wifi was not good and I wish pet owners would be RESPONSIBLE PET OWNERS by way of picking up after them and keeping them quiet (letting them continue to bark). A very nice park convenient to area attractions. I would recommend this park and would stay there again. Sites are very tight! Felt on top of my neighbor. No wifi at the site. Noisy past curfew. Clean. Nice campground. Close to Interstate 75 and 24. Camp sites were nice. Had internet service but really slow connection/speed to the point that it was difficult to use the internet at all especially at night. Bathrooms and showers were very clean. Propane refill on-site. 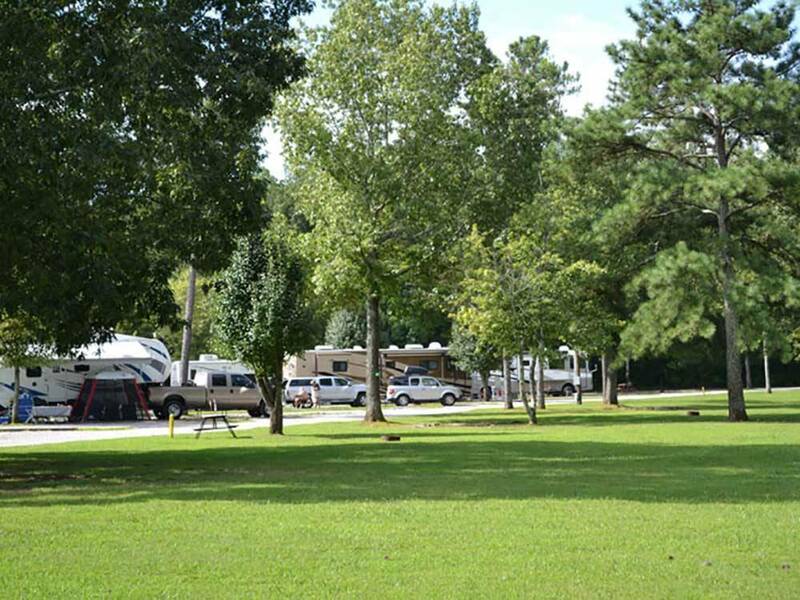 Park was clean; good shade trees; clean Rest Rooms and the staff was very friendly and very helpful with information about area attractions, restaurants and Wal-Mart locations (of course we need something else for our trailer). A Good experience !